It has become something of a tradition here at Sonic Charge to present something new around Christmas and this year is no exception. What began as a fairly small update to Permut8 soon escalated and became our most massive update endeavor yet. We ended up with new versions for each and every AU/VST plug-in that we sell: Microtonic 3.1.1, Synplant 1.2.1, Bitspeek 1.5 and Permut8 1.1. As usual, these updates are free of charge for existing customers. The biggest news are Bitspeek 1.5 and Permut8 1.1. Bitspeek 1.5 comes with the improved audio engine that is used in the Rack Extensions version. This means a vastly improved volume envelope tracker and true support for stereo input / output. ("Legacy mode" is available for backwards compatibility or if you just want Bitspeek to sound worse.) We have also added the frequently requested dry / wet mix knob (with proper latency compensation) as well as the standard set of "convenience features" that you can find in most of our products (copy / paste, undo / redo etc). If you don't own Bitspeek yet you can now try version 1.5 for three weeks with full functionality. Permut8 1.1 is the first version of Permut8 that officially supports "alternative firmwares" (although preliminary support was there in version 1.0 already). 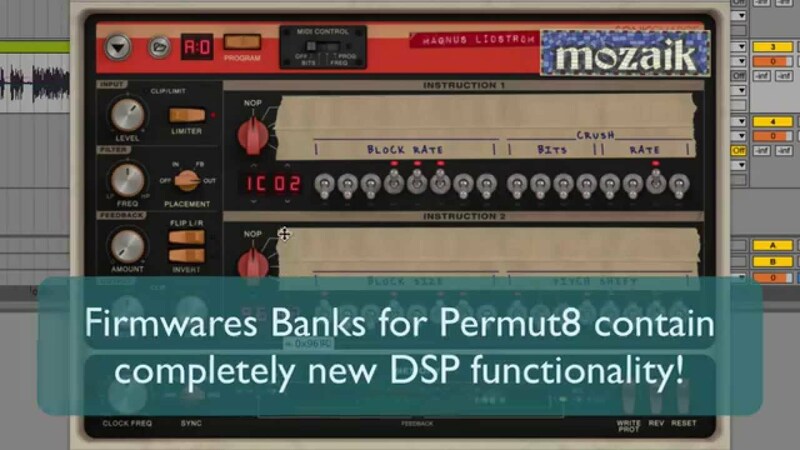 Alternative firmwares expands the functionality of Permut8 with entirely new DSP algorithms that you load into Permut8 simply by opening a special file type. The firmware code runs in a virtual CPU that is completely isolated from your native processor and cannot crash your host. Furthermore the actual DSP code is stored in your song files, so you will never need to keep track of which version of which firmware you used for a particular project. It will just work. Forever. And it will always sound exactly the same. Apart from this, Permut8 now supports undo / redo, bouncing to WAV file and much more. Microtonic 3.1.1 and Synplant 1.2.1 are relatively minor updates. We have added a couple of buttons in the file browsers for easier navigation between factory and user presets. 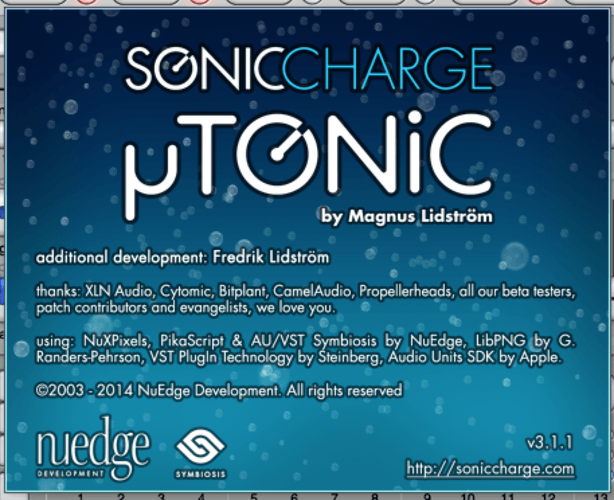 We have fixed a bunch of minor bugs and compatibility issues and they now include support for our new unified Sonic Charge Plug-in multi-installer. The multi-installer makes installing and upgrading our plug-ins a lot easier than before. Just click the fat download button on http://soniccharge.com/download to begin. All updates replace the old versions but they are 100% backwards compatible and should sound 100% identical when you load your old patches and songs. In the unlikely event that something goes wrong and you want to roll back you can find installers for the outdated versions on our download page. Last but not least we have introduced a bundle containing all four of our AU / VST plug-ins for the unbeatable price of $222 (excl. VAT in Europe). That's $75 saving. Happy holidays and sincere wishes for a fabulous 2015 from Magnus & Fredrik Lidström! Sweeeeet!!! Barely wait to try the new firmwares for Permut8. Just one notice: the info screen in µTonic still says "v3.1.0" after the update..
hi, many thanks for this. I'm really excited bout the new firmware for Permut8 - it's been a real grower for me and I'm using it more and more. One question - I can't see SAM in the firmware listing - has that now been replaced by Reciter? 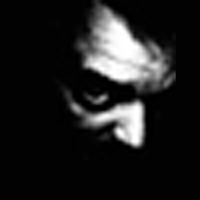 The .bin files have been reduced to linsub and ringmod. yes, I am an enormous dumbo. We must download the DSP packages from the permut8 page and install it. It looks like the .bin files are the old way to access the firmware (? guessing here) and the new way is to load a preset bank. When I loaded the reciter firmware, clicking on the About drop-down shows advanced speech options. Cool stuff Magnus - thanks for spending time on this little Christmas/Easter Egg! Thank Magnus. Cool. Long time was no hear. Very interesting will be to touch. Yes, Reciter completely replaces SAM. Reciter is a lot easier to use since you can simply click the tape to enter a new speech phrase. The old SAM firmware still works though but there is no point in using it since it sounds the same. You guys are a great company, thanks for caring about the update user experience and for the wet/dry control in Bitspeek! And what about microtonic scripts - it will be work without changes now ? For any case. thanks Magnus - really love Permut8 and I see you've added alot to the other plugin I have from you, Bitspeek. much thanks for all you do. You guys are fantastic. Thanks so much for this excellent bounty of goodies. Huge fan and love your software. Ever think of doing a VST Echobode? Since you've kinda integrated some of the code from the RE for Bitspeek, got me to thinking; while I own Reason and even upgrade it and maintain it, I rarely find myself as inspired as I am in my real DAWs, Bitwig/Renoise. Again, thanks for your great attitudes and pride and as usual your ultimate work effort. The new firmwares are just great!!! God I love this, Permut8 has been my go to plugin for my music and I use it a lot in my productions. I think I just cried a little happy tear when I noticed there is an experimental distorsion in the firmwares. Microtonic scripts should work without any problems. The randomize button for Permut8 however was a more brutal hack, basically replacing the entire user-interface with a copy that includes the button. We'll make a new version for V1.1 asap. Until then you'll have to use the menu. After you've randomized once you can shift-click the main menu button to quickly randomize again. shift-click the main menu button to quickly randomize again. Thanks everyone for all the kind words. I was honestly not expecting this much attention and appreciation for these updates. We've been working on many projects in parallel the last couple of years and we are finally at a point were all Sonic Charge plug-ins are based on the same solid platform. I hope this means we can increase the pace a bit both with upgrades and brand new releases. One of the projects we have been working on is an AU / VST port of Echobode (with some new knobs thrown in for fun). This will most likely be our next release, although Synplant 2.0 is coming along fine too. Here is to a magnificent 2015. I believe it will be a great year for Sonic Charge! wow...just wow--concerning the update to Permut8. It's always good when a company actively supports users who may be having trouble, but when a company continues to innovate, improve, and expand existing products that were already awesome like you guys do, it is something noteworthy. Add in the fact all these improvements were given free of charge for users...I am most grateful. I have been using Permut8 and MicroTonic for a couple years now, and cannot imagine working without either. Between the continuously expanding Patternarium and your enhancing the usefulness and possibilities of Permut8, Sonic Charge makes it's plugins easily the best value in the industry.